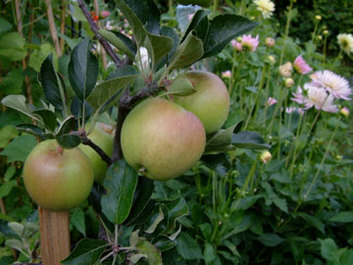 2018 has been a fantastic year for apples. This is an easy and quick way to use up some of this year's bumper crop. 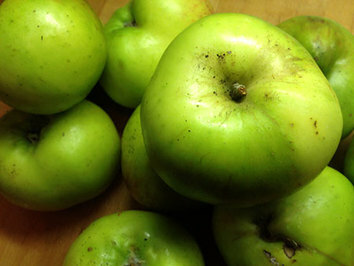 I use Bramleys as the cake mix is quite sweet so a slightly tart cooking apple works well. Cuts into 16 pieces so it's great for sharing and special occasions. It's freezable too. Heat oven to 180C/fan 160C/gas 4. Butter and line a rectangular baking tin (approx 27cm x 20cm) with parchment paper. Peel, core and thinly slice the apples then squeeze the lemon juice over. Set to one side. Place the butter, caster sugar, eggs, vanilla, flour and baking powder into a large bowl and mix well until smooth. Sprinkle a little caster sugar on the parchment paper in your tin and cover the base with one layer of sliced apples. Spread half mixture on top of the apples in the prepared tin. Arrange half the remaining apples over the top of the mixture, then repeat the layers. Leave to cool for 10 mins, then turn out of tin on to a rack and remove paper. The apple layer at the bottom of the tin should be slightly caramelised and makes a nice looking 'top' layer once the cake is cooled and cut. Remember you can freeze this cake for future enjoyment. It's good warmed up with a little crème fraiche.